Embryonic stem (ES) and induced pluripotent stem (iPS) cell colonies spontaneously differentiate and form three-dimensional multicellular aggregates, called embryoid bodies (EBs), when cultured in suspension without key stem cell growth factors. EB formation is a common intermediate during the in vitro differentiation of ES/iPS cells into specialized cell types. The size distribution of embryonic stem cells play a significant role in the efficiency of differentiation and in production yields (Dang et al. 2004; Ng et al. 2005; Falconnet et al. 2006). Cultures maintained by enzymatic passage result in the formation of a heterogeneous embryoid bodies population, varying in size and morphology, and in the ultimate yield of differentiated cells. Recent efforts to enrich EBs of preferred size to increase differentiation potential have included biocompatible coatings (Valamehr et al. 2008), microcontact printing (Bauwens et al. 2008), and forced aggregation systems (Burridge et al, 2007) with some success. The EB Generation Application on LEAP™ (Cyntellect, Inc.) was introduced, enabling the automated generation of EBs of specific sizes. These developments for improved embryoid body generation have led to a need for routine quality assessment of the embryoid body number, size and shape. The Celigo colony counting embryoid body application quickly and accurately analyzes embryoid body populations of all shapes and sizes, and does so in a non-destructive manner so that the embryoid bodies analyzed can be subsequently used. Current methods typically require acquisition of hundreds of images on a standard microscope followed by manual analysis or loading into another software program which provides only basic measurements (e.g., EB diameter). Because these analyses are difficult and slow, thorough characterization of embryoid bodies prior to differentiation is often omitted. A fast, automated method for embryoid body analysis greatly reduces the time and effort needed, and allows quality control of embryoid bodies prior to investing in long-term differentiation cultures. In addition, embryoid body characteristics which enhance particular differentiation pathways can be identified to improve differentiation efficiency and reduce culture costs. The colony counting embryoid body application uses the Celigo large area rapid scanning capability to count and determine the size, shape, and morphology of embryoid bodies. 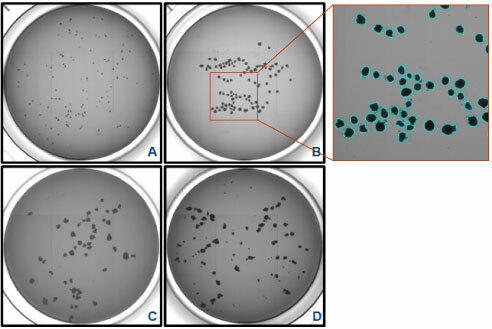 The system records whole-well images of multi-well (384W to 6W) plates, enabling the tracking of live embryoid body characteristics for correlation with final differentiation patterns.